For years, years, I had a light fixture in storage. It had been repainted in many many many zippy colors. Just dreadful. I suspect hippies were the culprits. 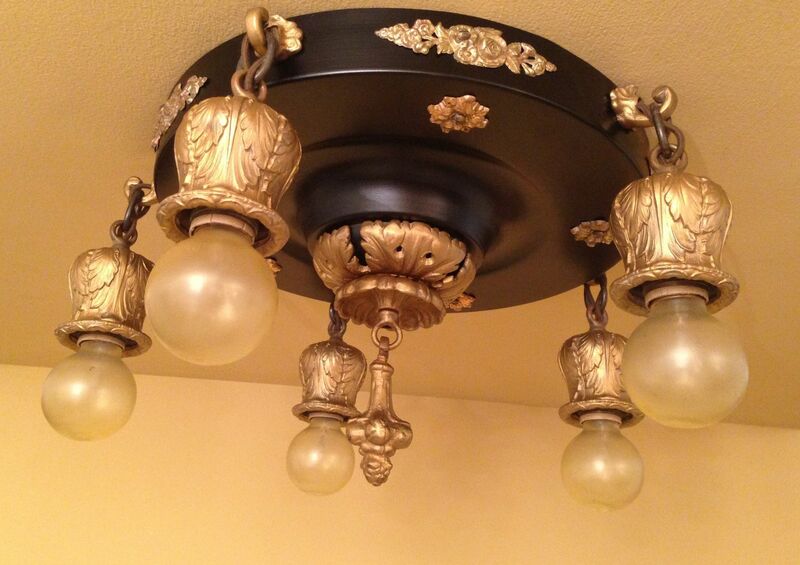 I knew that buried under all the color was a lovely 1920s pan-style fixture. I just had to strip it to reveal the hidden beauty. But every time I paused to look at the fixture I would think: I don’t have the time. Maybe later. The other day I paused yet again before the fixture and thought: I don’t have the time. Maybe later. Then an inner voice scolded: Oh for God’s sake. JUST DO IT! So I hauled the damn fixture out of my vast storage vaults, stripped off the damn paint, and gasped when it was all done. I could kick myself for not taking a Before image. Oh MY- this is beautiful. That’s a stunner! What did you use this strip the paint so beautifully? I love this so much!